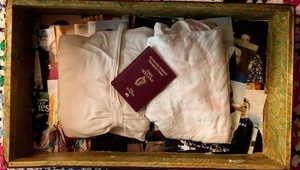 Posted in Misc and tagged time magazine, Together For Yes at 1:10 pm on April 17, 2019 by Bodger. A a ‘pay-what-you-want’ released single today with all proceeds going to Together for Yes. Written by Oliver Cole and Claire Cogan Cole, and featuring Ham Sandwich’s Niamh Farrell. The song looks at the issue from the perspective of a couple who find themselves having to travel to the UK to access safe medical care…. Posted in Misc and tagged Together For Yes at 5:10 pm on May 11, 2018 by Bodger. At St Peter’s Church on North Main Street. 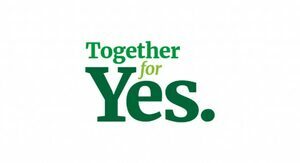 Together For Yes will hold a media event – a month ahead of the referendum on the Eighth Amendment on May 25, 2018. 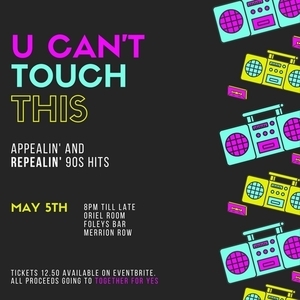 Those speaking at the event will include Orla O’Connor, Co-Director of Together For Yes; musician John Spillane, broadcaster and journalist, who will be MC, Joe O’Shea; and GP Mary Favier, of Doctors Together For Yes. There will be a public meeting in the Glasshouse Hotel during which Galway Independent TD Catherine Connolly and Ulster University’s Dr Fiona Bloomer will talk about abortion, the workplace and why a Yes vote on May 25 is “vital to protect the health and lives of women and girls living in Ireland”. Pat Fallon, of the trade union IMPACT, will preside over the event while other local trade union activists will also address those present. Posted in Misc and tagged Cork, sligo, Together For Yes at 1:11 pm on April 24, 2018 by Bodger. Above: from left: Paddy Connolly, CEO Inclusion Ireland, Evie Nevin, founder of Disabled People Together for Yes , Finian McGrath, Minister of State with Responsibility for Disability Issues, Suzy Byrne, Disability Rights activist and D. Mark Murphy, spokesperson for Together for Yes. 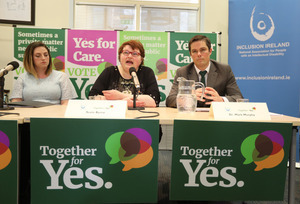 A launch by Inclusion Ireland, the National Association for People with Intellectual Disability and Together for Yes in a campaign to remove the Eight Amendment in the forthcoming referendum. Together for Yes spokesperson Dr Mark Murphy said. Posted in Misc and tagged The Eighth Amendment, Together For Yes at 1:26 pm on April 16, 2018 by Bodger. We are overwhelmed! A GIGANTIC thank you to the amazing 2,426 people who helped us hit our crowdfunding goal of €100,000 in FOUR hours!! Posted in Misc and tagged 000, Together For Yes, €100 at 1:06 pm on April 10, 2018 by Bodger.